A pregnant belly needn't be a hindrance to cosplay; in fact, there are certain costumes that are best pulled off while pregnant. This lady is playing host to that supervillain from Dimension X, the Teenage Mutant Ninja Turtle's brain-like foe, Krang. Artist Eli Nick painted this monstrosity on her best friend's body. 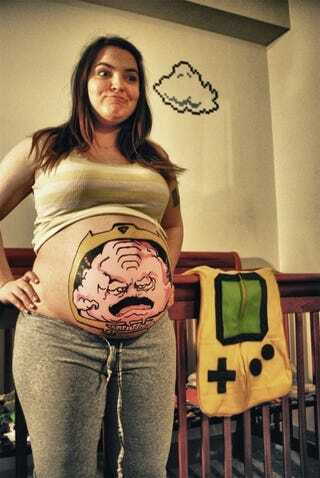 Hopefully, the baby turns out cuter than Krang.